Soils provide plants with a place to sink their roots, a way to hold moisture, and a source of nutrients . In Rock Creek Park, as everywhere, different types of soils support different types of plants. Knowing something about the soil in a place helps you predict what natural communities you might find there. But soil is more than just pulverized rock. Ecobit: Soil—It’s Not Just Dirt! For information on how soil is formed, topsoil , and soil textures, see Soils in Ecology Basics. Acidic soil weathered from bedrock on a hillside above Rock Creek in D.C. Photographer: Tony FlemingBecause most soils are acidic to some degree, ecologists often use the term “acidic” to describe very acidic soils, and “basic” to describe soils that are relatively less acidic. Ecobit: “Basic” and “Acidic” Truly basic soils with a pH greater than 7.5 are nearly impossible for many plants to grow in. In general, strongly acidic soils are considered infertile (containing little that plants can make use of), and less acidic or nearly neutral soils are considered fertile. Most of the soils in Rock Creek Park are acidic, mainly because the bedrock underlying most of the park contains relatively few minerals made of base elements. Furthermore, soil pH continues to change over time. As rain percolates through soil, it removes base elements, gradually increasing the acidity. This process is called leaching . Most soils initially weathered from somewhat basic rocks in the park now have an acidic pH. The Chestnut Oak / Mountain Laurel Forest at Rock Creek Park. Photographer: Sam ShelineThe most leached parts of Rock Creek’s landscape occur on hilltops and ridges. An example is the ridge on which both the Nature Center and Picnic Area 16 sit. Because of the elevation and the gravelly sediment underlying the soil, rain runs quickly through the soil, washing away nutrients. These ancient gravelly ridgetops have been leached for vast amounts of time, producing extremely nutrient-poor, acidic soils. Map tip: Check out the knoll above Picnic Area 16 to see what a natural community on strongly acidic soil looks like. To find this location, go to the interactive map of Rock Creek Park and search for "picnic 16." Or search for "good places" and select Chestnut Oak / Mountain Laurel Forest on White Horse Trail. Although nearly all the bedrock-derived soils in Rock Creek Park are technically acidic—most with a pH of 6 or less1—some are less so, and they tend to support a wider variety of plants. The less acidic soils contain calcium, magnesium, and other base elements that encourage more vigorous plant growth. Usually these areas are underlain by bedrock containing minerals made of these base elements. Sometimes nutrient-enriched soils occur even where the underlying parent bedrock is fairly acidic. For example, where groundwater comes to the surface in ravines and along the bottoms of hillsides, it enriches the soil with dissolved bases leached from soils and bedrock higher in the landscape. 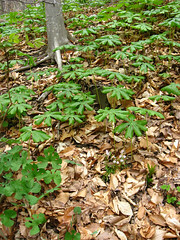 Newly emerged mayapple and bloodroot plants give a lush look to a Basic Mesic Hardwood Forest in Melvin Hazen Valley. Photographer: Erin Lunsford JonesPlant communities growing on soils that contain more calcium and base nutrients can support a much wider array of plant species—especially herbaceous plants (non-woody). These communities have the potential to appear quite lush in spring and summer. Many trees also tend to grow larger than usual in nutrient-rich soils. Certain plants in Rock Creek Park, such as white ash, American basswood, slippery elm, sugar maple, pawpaw, northern spicebush, Dutchman’s breeches, and mayapple tend to grow mostly in nutrient-enriched soils. When you see these plant species growing together in community—in the Basic Mesic Hardwood Forest—you can deduce that the soil originated from basic rocks or is enriched by groundwater. Map tip: You can find examples of what a natural community on nutrient-enriched soils looks like. Go to the interactive map of Rock Creek Park and search for "good places," and select either example of Basic Mesic Hardwood Forest. 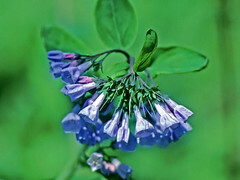 The Virginia bluebell (Mertensia virginica) is one nutrient-hungry plant that can be found along Rock Creek in the Tuliptree Small-Stream Floodplain Forest. Map tip: You can find examples of what a natural community on fertile alluvial soils looks like. Go to the interactive map of Rock Creek Park and search for "good places," and select any example of Tuliptree Small-Stream Floodplain Forest. By the way, why don't certain of the nutrient-hungry species found in the Basic Mesic Hardwood Forest also grow in the nutrient-rich soils of the Tuliptree Small-Stream Floodplain Forest? See Ecobit: Rich but Hard to Live With. Groups of soils with shared traits are called soil series and in Rock Creek Park, the most common soil series are the Manor and Glenelg loams . 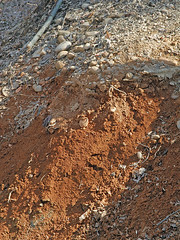 (The names of soil series come from the location where the series was first described). These soils are loamy, which means they are medium textured and consist of roughly equal proportions of sand , silt, and clay . Ecobit: A Speck of Difference These soils occur throughout most of Rock Creek Park other than its floodplains. Their fertility is generally poor, but can vary depending on position in the landscape, typically being more fertile in lower landscape positions where soils are deeper or groundwater is close to the surface. 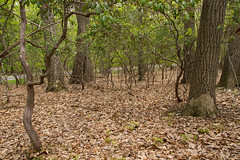 The natural community most often found on such soils is the Mesic Mixed Hardwood Forest, which is the most common and widespread plant community in the park. The Oak – Beech / Heath Forest, a drier, more acidic community, can also grow on these soils on steep slopes (see the Topography section). 1. Smith H. 1976. Soil survey of District of Columbia. Scale: 1:12,000. 2. Smith H. 1976. Soil survey of District of Columbia. Scale: 1:12,000.